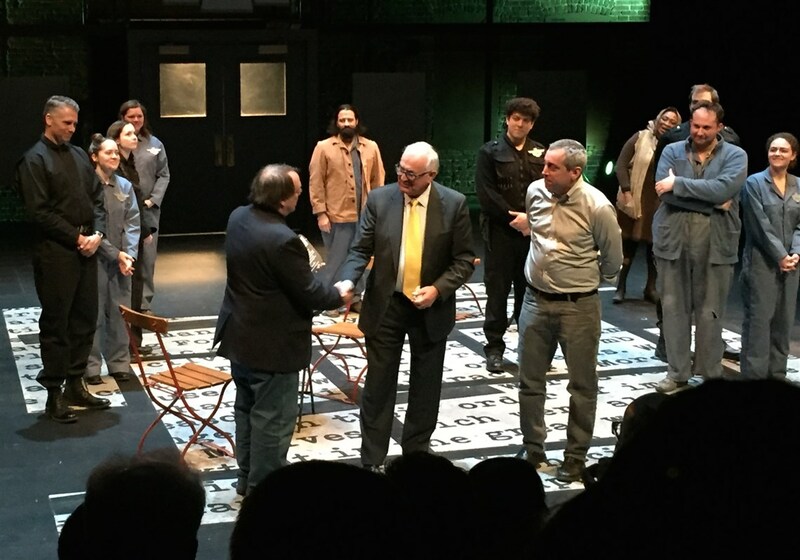 Nineteen Eighty Four in Pittsburgh – "A trip worth making"
In the autumn of 2016 I was informed that Prime Stage Theatre in Pittsburgh were staging a production of Nineteen Eighty Four and would I, via the Orwell Society, be willing to come over and be present at the opening night. After some consideration I agreed that if they paid for my accommodation and a donation to the society, I would be willing to finance my travel. This was all agreed and on Thursday 2nd March 2017 I flew over to Pittsburgh, where I was made very welcome and met some of the executives on Friday morning and had an private tour with a guide of the Heinz History Centre (Pittsburgh being the headquarters of the company), This was followed by a most agreeable dinner and tour of the (Helen) Frick Gallery in the evening, with its magnificent art collection, part of the Henry Frick collection of New York. I was entertained by Mr and Mrs Nicolson, the curator of the gallery, Prof. Russell, English Professor, specialising in Orwell studies, Jonathon Seaton, Director of the Pittsburgh Opera and Robert Charlesworth, who is a director of Britburg, an organisation dedicated to Pittsburgh-British connections. So ended the first day. Saturday dawned sunny and cold and at 09.30 I was picked up by Wayne Brinda, who has organised my visit and is also the Treasurer of the Prime Stage, who took me to a children’s radio programme, where three very switched on 14 year girls asked me questions about Orwell, I also spoke a little about my life with him. This lasted for about forty five minutes and went out all over the States. Following the interview I was then driven to an out of town mall to take part in a discussion with members of the public at Barnes and Noble, a very large book shop. When I arrived there were about forty people waiting, so at about 11.45 I gave them an introduction to the origins of Nineteen Eighty Four and my life on Jura. This was followed by a Q and A session, lasting about an hour, after which I did a book signing session for the next ninety minutes, not just one book per person, but two or three. I was surprised at the number of first editions I saw, plus several copies of the “Facsimiles”. At 06.30 in the evening I was taken to the theatre to meet the cast prior to the first night and more book signings. The performance was excellent, quite conventional, but with an extremely funny sequence at the beginning of the second half, between Winston and Julia, before the startling climax of their capture. To those in the audience, who were not familiar to the story and there were some, this came as a powerful shock. At the end I was called out in front of the audience, who were by this time giving a standing ovation, to present one of the Barnhill slates. I decided to make the presentation to the theatre as a whole, so it would include everybody. I also took the opportunity to explain the significance of the award, which seemed to go down with immense appreciation. There then followed another long session of book signing until the theatre closed. It was at this point that Wayne Brinda and his wife Connie, who is the secretary, informed me that the board had approved a donation of $1000 plus 40% of all book sales of not only Nineteen Eighty Four but also Animal Farm and The Road To Wigan Pier made during the run of the play to the Orwell Society. They are an amateur theatre company, who rent the premises from the city council, so they are not flush with money. It is a theatre of about 320 seats and I am reliably informed that most seats are booked for the duration until it finishes on the 12th March. The next day was the matinee performance and before the start I was invited in to the dressing room to meet the cast again, where I recited that rather raunchy poem, “Romance” This went down with rather well. They appreciated the humour. There followed an “afternoon tea” to meet the son of Orwell! More speeches and book signing before the afternoon performance. At the end I was again invited out to the front and to take a bow with the cast, followed by a proclamation by a city councillor that this was to be known as “Orwell Day”, to which I presented another slate to the City of Pittsburgh, more explanations, photos and then a talk to the audience about my life with Orwell, followed by another Q and A. and book signing. So ended a very full two days and by all accounts Prime Stage Theatre Co got their monies-worth. Their enthusiasm knew no bounds, so I took it that they were satisfied with my visit. The day ended with another excellent dinner at one of Pittsburgh’s finest Italian restaurants, where I presented Wayne and Connie Brinda with the last of the slates I had taken out and in return I was given an etched profile of the city in aluminium, plus a cheque for $1000. The money from the book sales will follow on later. I returned home on the morning of the 6th March relaxed in the knowledge that it had been a trip worth making.. I enjoyed the travelog very much and I wondered if the interview might be on the OS podcast someday.